The number one question we get asked over, and over, and over again is: “How can you afford to travel and live abroad?” I’d like to delve into this topic over the next couple months, as it’s not easily answered in one simple blog post. The ability to live and travel abroad isn’t as unattainable as you might think; It takes practice, patience, and dedication. I have so many thoughts I’d like to share with you on the topic, but for now let’s just keep it simple. 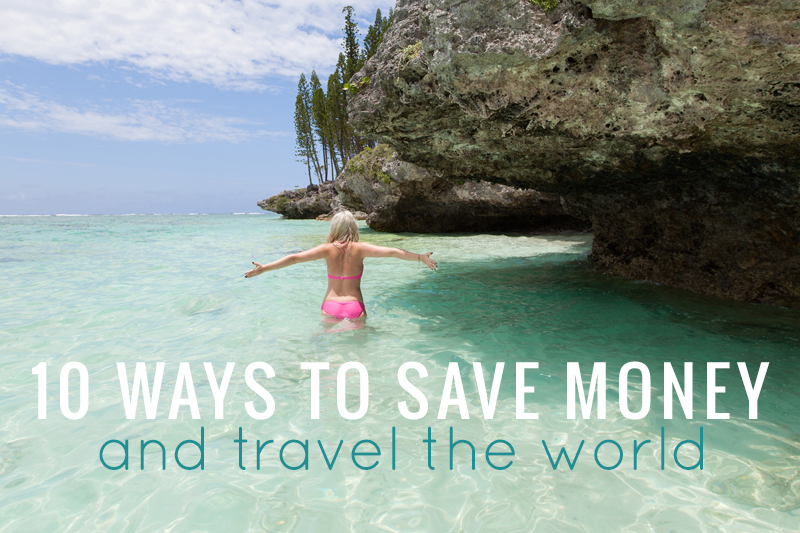 One of the most important aspects of traveling (and living abroad) is the money-factor. Duh. Believe it or not, you don’t have to have a ton of cash or a lavish lifestyle to afford a nomadic life. Most of us that travel have become self-proclaimed pros in the area of saving and making our dollars stretch to the max. Here are a few of my money-saving practices. It doesn’t have to be painful to save, and if you incorporate these ideas in your daily life, soon they’ll become habits you automatically do without thinking. 1. Have your bank automatically transfer money from your checking to savings on payday. Derik and I have been doing this since 2010. The amount you automatically transfer doesn’t have to be super substantial, but just enough to start building your savings without you even thinking about it! If you get paid Bi-weekly and transfer $25 dollars each time, by the end of the year you will have saved $650 dollars. If you get paid once a month and transfer $75 each time, by the end of the year you will have saved $900 dollars. Or just cafe-bought coffee in general. I can’t remember how much a latte or frappuccino is in the States, but here in NZ it can range anywhere from $6-10 dollars a cup! I love my Starbucks, but I can save so much money by making my own coffee at home. I treat myself out to coffee once every two weeks instead of going 1-2 times per week. If you buy 2 cups of coffee (assuming they’re around $6.oo each) every week for a year you will have spent approx. $624 dollars on coffee. If you decide to save on coffee and instead buy one cup every other week you will have saved yourself approx. $465 dollars on coffee per year. 3. Make a conscious effort to buy food that’s ‘in season’. I know, I know, I love strawberries in January too. However, buying them will be twice if not triple the cost that they will be in the summer. Opt for seasonal veggies and fruit, and splurge once every once in a while on something more ‘exotic’ for that time of year. Trust me on this, you’ll be cutting your grocery bill at least by a third! 4. Designate days to eat out. Be aware of menu cost. Going to a restaurant for a meal can be nice, especially when you don’t feel like cooking. However those ‘easy meals’ can add up over time! It’s particularly expensive to eat out in New Zealand: the average plate cost $16-25 dollars. We designate Fridays as ‘date nights,’ and do our best to keep our restaurant spending in check. If we can share a plate, we most definitely will! We also limit visiting pubs, as a couple of drinks each means we’ll be paying a tab of $40+ dollars. The closer we get to travel dates the less frequently we take our date nights. Derik and I love cooking together at home anyway, so eating at home most nights isn’t that terrible for us. 5. Make your own work lunches. Because we eat at home so much, we make big dinners and use the leftovers for lunches the next day. It works well and saves a ton of money! A cheap lunch out can cost anywhere from $7-15 dollars, and if you ate out 3 of 5 days within the work week, you’re still spending over $1,000 each year on food cost when you could be bringing your own homemade lunches (from dinner leftovers) at minimal cost of around $1-4 dollars per meal! 6. Go through your wardrobe and sell clothes you don’t wear anymore. U.S. second-hand clothing stores like Plato’s Closet and Buffalo Exchange will actually buy your old name-brand clothing from you if they’re still in good condition. Before we left for Korea I sold over 1/2 of my wardrobe and made a little over $200 bucks! Nothing like a little spending money from items you don’t want anymore! 7. Carpool when you can (or take the bus). Gas is expensive (right now it’s $1.89 per liter in New Zealand (4 liters= 1 gallon). A large portion of our weekly paycheck goes to gas as Derik has to drive 3o minutes round trip to get to work. We also enjoy working out at the gym 2-3 times a week, so anyway we can keep our milage down the better! Some days I go in with him and work from a coffee shop during the day, and other times I just opt to stay at home and let Derik go to the gym himself after he is finished with work so he doesn’t have to drive all the way home and pick me up, just to go back into town again. There’s a bus stop not 25 feet from our house, and you can pay a minimal amount to get a ride straight to city centre. If you have the opportunity to carpool with a coworker, or use public transportation to save on gas, go for it! 8. Visit the salon less frequently. Getting my hair trimmed and colored at the Paul Mitchell cosmetology school in Portland, Oregon cost me $80 each time (that’s crazy cheap for semi-long hair). After one year I was spending more than $600 dollars on my hair per year. Gross. That’s a roundtrip ticket to the other side of the world if you play it right. Just saying. 9. Refrain from shopping out of boredom. I don’t window-shop anymore. I also don’t go shopping on big sale holidays. The reason why? I don’t want to be tempted to buy crap I really don’t need. As a mobile expat/traveler buying things we don’t need just adds luggage weight and mass for when we move next. It also means I will most likely have to get rid of it, or something else later down the road. I have learned to only go shopping when Derik and I actually need something new to replace another item (such as clothing) that’s worn out or not working right (technology). Learning to distinguish between what you want and need isn’t always a fun process, but it’s necessary if you’re serious about saving money. 10. Take on a few extra work projects. If you’re boss lets you, try working a few extra days per month and save that money purely for travel. Since I’m self-employed, I try to take on a few extra clients in the months leading up to our travel dates, just so we have a little extra money in our pockets for accommodation, food, and travel insurance. By incorporating these money-saving tricks into your life, you’ll be hitting the open road in no time! Share your saving practices in the comments below!